We keep on examining inexpensive professional sound cards. The epoch of hardware MIDI wavetable synthesizers and hardware effect-processors is close to its end. Capabilities of the best sound cards in this field (Yamaha XG and SoundBlaster Live!) can be used today probably only in karaoke and old DOS games. We are currently witnessing a beginning of the new era of high-quality sound and professional program solutions in audio computers. At $200 you can get a sound card with minimal sound processing features but with professional ADC/DAC and support of special low latency interfaces (ASIO, GSIF, EASI). Now one can use a powerful PC with a 1..2 GHz central processor and hundreds of megabytes of memory for music creation. With such system it is easy to achieve a professional sound if we use a software synthesizer (Gigastudio, Reason, Halion etc.) 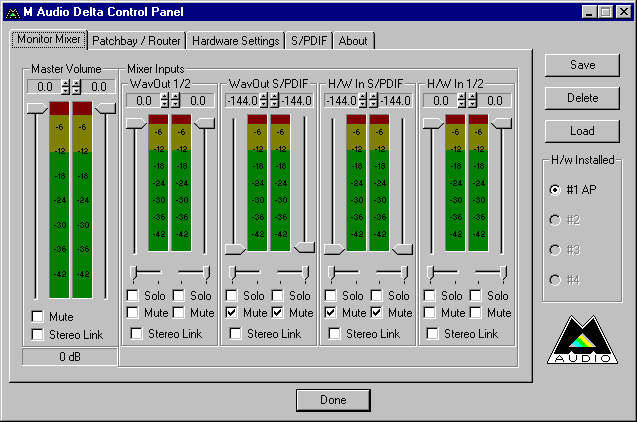 controlled by MIDI and with effect plugins (VST, DirectX). Besides, people who don't understand much in music theory but who have a good taste, sense of rhythm and thirst for music creation can also take part in this process as there are various DJ-like programs (AcidLoop, eJay, Mixman Studio) where one can make his own compositions by mixing different samples and loops. Of course, it's clear that it is incorrect to compare sound cards of different prices and purposes. 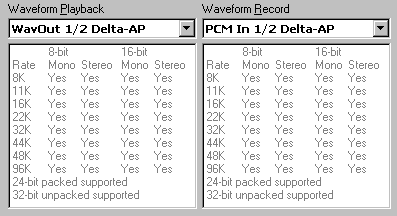 For example, almost all professional cards don't have a normal hardware DirectSound/DirectSound3D support (which results in delays and stuttering of sound in games), can't output 5.1 sound after program decoding of DolbyDigital/DTS into WinDVD/PowerDVD because 6 analog-outs are lacking, and don't support any algorithms of 3D sound positioning. It is interesting that in 2002 many companies are going to release products which will wash away borders between professional and multimedia segments of the market (for example, Terratec 6fire DMX). For a musician it must also have good drivers (multiclient support, various fine hardware settings, low latency in the professional interfaces - ASIO, GSIF, EASI). 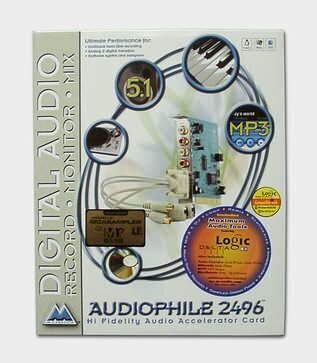 Today we will examine exactly such card - M-Audio Audiophile 2496. M-Audio is a subdivision of Midiman founded in 1999 which deals in development and promotion of inexpensive and high-quality professional digital sound devices for PC and Mac. It's interesting that the UK's Computer Music Magazine, which writes about music creation on PC, published the results of polling of its readers. And it was the first time for the last several years that the Audiophile 2496 outpaced the SoundBlaster Live! as "The Best Sound Card of the Year" in 2001. CD with Maximum AudioTools utilities. 9-pin connector for external interfaces. There are no any internal connectors (like CD Analog In or CD S/PDIF in), which is a little drawback of the card. 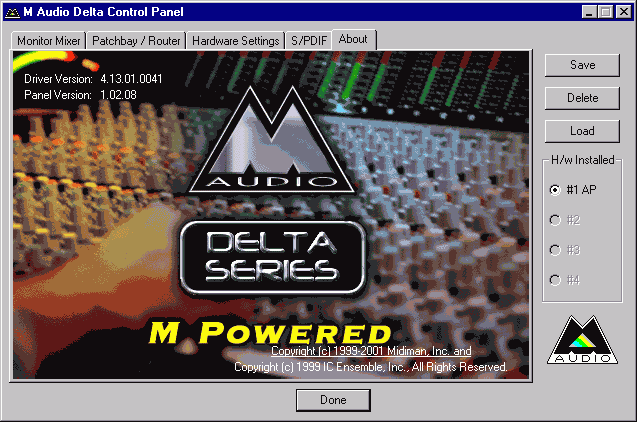 The cards of the M-Audio Delta family come with universal drivers which are updated quite often. We used ver.4.13.01.0041 of 13.12.2001. Like in most cases, a user can control modes of the card via the Control Panel. The M-Audio Delta Control Panel is not easily comprehensible. First of all, there is no any signal-flow diagram. However, it's not difficult to draw it in our mind after reading the manual carefully and a bit of experimenting. The first tab concerns Monitor Mixer. Inactive settings in this tab are meant for other cards of the Delta family. Note that there are both multiclient support and support of ASIO, EASI and GSIF, but there is no transparent manual distribution of interfaces among devices. 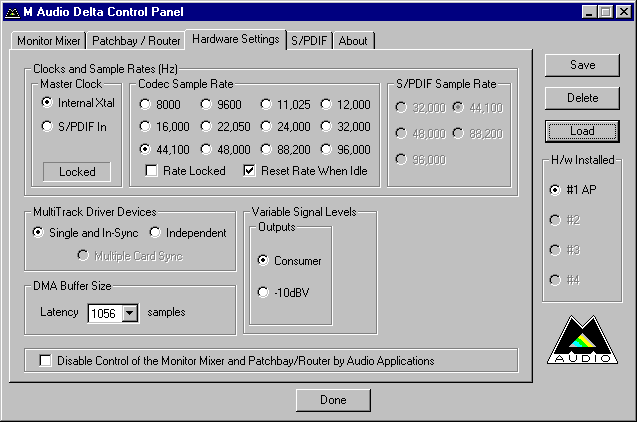 The Codec Sample Rate indicates the current mode only. The Rate Locked shows whether an application uses a specified sampling frequency (otherwise, you will see "MMSYSTEM032"). 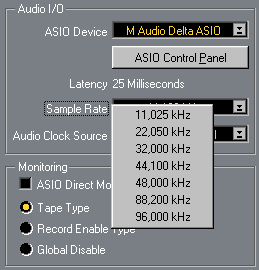 The S/PDIF Sample Rate gets activated in the Master Clock = S/PDIF In. And if there is a signal and if it is identified successfully you will see "Locked" below. The user manual says that Xtal stands for crystal, which generates a master clock frequency. 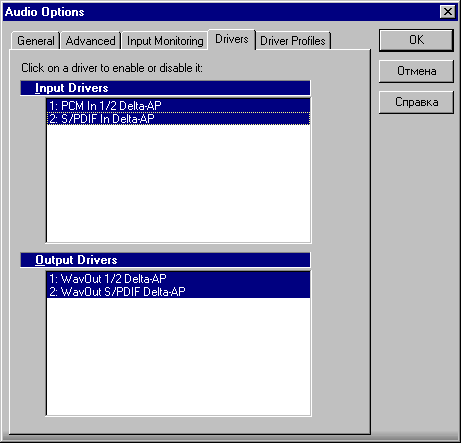 MultiTrack Driver Devices. This function synchronizes a start of reproduction/recording of tracks in one or in different applications simultaneously. Variable Signal Levels. Here you can choose two volume levels of the output signal: +2 dBV (Consumer) and -4 dBV (-10 dBV). The level of the input signal is +2 dBV and can't be changed. It is obvious that for recording from the linear-in it's necessary to use audio equipment with a standard linear-out or a recording level controller of the external device (for example, faders of the audio mixer). H/W 1/2 In in the Monitor Mixer means that we can monitor a signal and adjust volume of the playback level, but it doesn't affect a recording level. DMA Buffer Size offers a list of buffers which are not of the second power. It's a little bit strange and unusual. 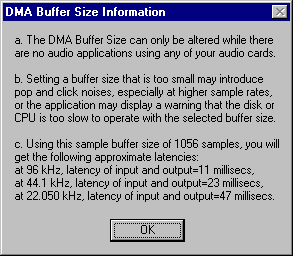 To avoid the problem of pops in real applications it's better to run the internal diagnostics and match the DMA buffer size with the specified one in this panel. 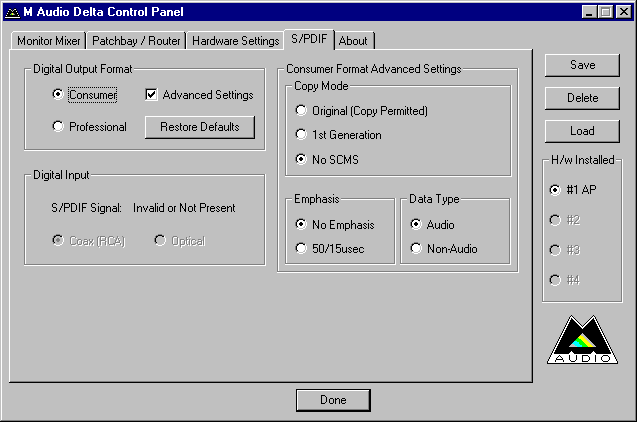 The digital-out tab allows adjusting different parameters. One of the most important items is Data Type which makes possible to transfer a DolbyDigital/DTS signal to the external decoder. 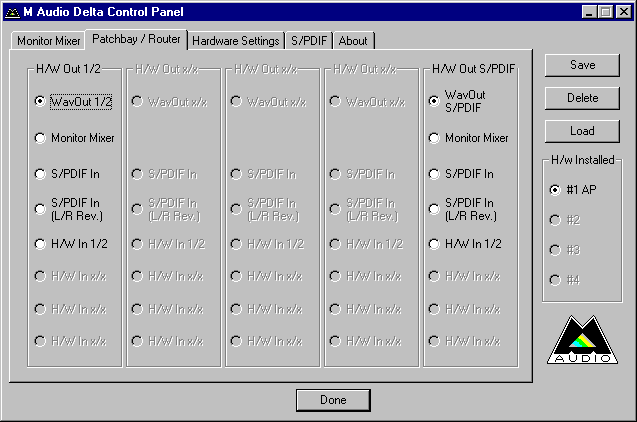 The About tab indicates the version of the drivers and of the Control Panel. In general, the M-Audio Delta Control Panel offers wide, but non-obvious settings of the card's modes. However, the printed manual explains each item in detail. Here we come across some implicit multiclient support. The GSIF lives somehow with the MME on one device. At the same time, the ASIO can be used in parallel. When the WDM drivers (in the W98/ME as well) are installed there are Multichannel Delta-AP devices for playback and recording. They are based on the WaveOut 1/2 and support operation with several applications simultaneously (I tried to turn on sound in 5 different applications at the same time, and it all worked well). But everything can change in the new driver version. However, the operation in the Sonar with the VxD drivers is not flawless: I had to set latency >50 ms to remove pops and clicks during recording (although there was only one MIDI track with GSIF). The Sonar is not the best choice for cards (like Hoontech DSP24 Value) which have good VxD drivers only because of the slow MME interface. At the same time, there are no problems with the WDM drivers with the latency equal to 10 ms. In my favorite ASIO-oriented Cubase5 everything works flawlessly from the very beginning with any drivers (because there is a separate library for ASIO - deltasio.dll). The minimal latency here is 2 ms, and a sampling frequency can be changed from 11 kHz to 96 kHz. In the tests we used RMAA 3.3 (the official site of the project is audio.rightmark.org). For the loopback we used a short OFC microphone cable with gold-plated connectors. First of all, let's take a look at the mode which is used for listening to CD-DA, and for music processing on relatively weak computers. Excellent scores, though I expected more from the card based on the AK4528. Anyway, just look at the smooth noise spectrum. Harmonics are almost absent! By the way, selection of a playback device (WaveOut 1/2 or WaveOut S/PDIF) and settings of the control panel do not affect the results of measurements. The test in the 48kHz mode suits for playing DVD movies and listening to music concerts in the DolbyDigital format, as well as in the PCM one. As expected, the results at 48 kHz are excellent and similar to the 44.1kHz mode. 24bit/96kHz is meant for the DVD Audio LPCM format and a really professional level of sound recording and playback. I failed to test the digital interfaces by connecting the input and output. But I managed to test the output separately using the Waveterminal 2496 and enabling synchronization taken from the input S/PDIF stream, and the results were excellent, just bit-to-bit precision! It's obvious that the high scores are on the account of the separate transceiver chip CS8427. The Hoontech is a tad behind all. The WT2496 plays quieter but it also is more expensive. The Echo MIA on the AK4528 behaves confidently. But note that the difference between all these cards can become noticeable only on high-quality studio monitors or very expensive headphones. For listening I used direct field studio Event 20/20 bas monitors which were connected with professional Proel O.F.C. microphone cables with gold-plated connectors. The M-Audio Audiophile 2496 was also compared with the EGOSYS Waveterminal 2496 card with the AKM AK4524 codec. I must say that according to the specifications the AK4524 and AK4528 codecs differ only in the ADC (the senior model has a better one by 4 dB). The DACs are fully identical. I cleaned my ears with alcohol-wet cotton wool and spent several hours to listen to the cards changing compositions and reswitching them immediately in my hardware audio mixer Behringer. The sound of both cards was impeccable! The difference between the cards in both 16/44 and 24/96 modes is hardly noticeable. But still, like in case of the Hoontech Audio DSP24 Value, I'd prefer the Egosys Waveterminal. Its sound was a little bit more transparent and brighter. But it's possible that someone else would like the M-Audio Audiophile more. The M-Audio Audiophile 2496 made a good impression on us. It is a professional quality inexpensive audio solution. 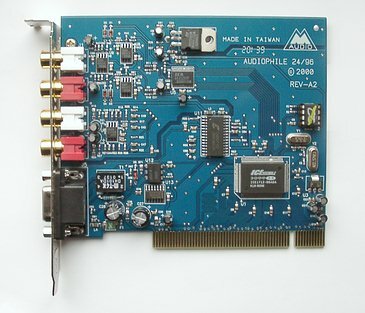 Despite the word "audiophile" in its name, the card will, first of all, be interesting for a computer musician, and only after that a lover of high-quality music playback. not a high price (less than $200). lack of an internal digital-in.